Why are the holidays and celebrations such a flurry of overeating? 1) Emotional Stress – most people find holiday commitments emotionally and physically stressful. Cortisol, the stress hormone, increases the crave for starchy foods and desserts and cause the body to convert glucose to stored belly fat. 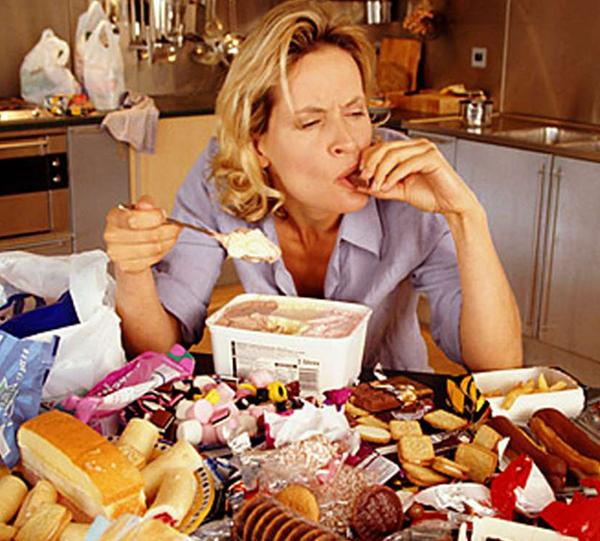 Stress also causes us to crave for comfort foods which is loaded with high glycemic index ingredients. Holidays often trigger or increase feelings of depression and loneliness for many that turn to emotional eating to distract and soothe themselves. 2) Travel Stress – broken exercise, eating, and sleep routines throw off our circadian rhythm and cause us to eat more for energy, grab quickly available food and sit more and move less. We tend to have less control of our schedule and foods we eat during the holiday and find ourselves distracted with non routine plans, goals and events that take our focus away from eating healthy and getting enough rest and exercise. 3) Social Pressure – indulging during the holidays is socially acceptable by family and peers. We are encouraged to relax, stop worrying and eat whatever you want. We feel obligated to eat the home made sweets our loved ones hand prepared. We feel eating as much as we can at holiday gatherings is the polite way to show our appreciation to the host and participate in the celebration with family and friends. Many cultures use eating as a common form of bonding and celebrating. All of these features of the holiday gatherings and celebrations represent cues to overeat. If you don’t deliberately be mindful and respond wisely, you most likely will follow the cues and overeat between Thanksgiving to New Year and gain an average of 5 lbs. easily. If you want to be mindful and choose wisely, you have to plan, prioritize and act accordingly. Eat fats such as grass fed animals, butter, and ghee, wild salmon, pastured eggs, avocados, coconut oil and butter and organic EVOO. Getting a healthy dose of the good fats will give you a solid foundation of nutrition and a strong defense against the unhealthy consequences of the less health foods you consume. Don’t skip breakfast and lunch so that you are starving by dinner to allow more room to overeat at dinner, instead, be smart about planning what you will eat and what you will pass on. Start your meal with healthy fats, vegetables and protein and that will leave you with less room for the starches and desserts. Healthy fats will give you sustained energy and healthy protein will suppress your appetite. Starting your meals with fats and protein will diminish your craving for sweets. Find a balance between honoring your health goals and relax, and enjoy the festivities. Don’t go to one extreme or the other such as eating whatever I want and get back on track on January 2nd or the following Monday. You want to make a choice to eat in a moderate manner and not just eat randomly because other people are over eating. On the flip side, don’t be so rigid that you set yourself up with failure. Trying to stay 100% strict will ultimately end up in giving in to all those overeating cues with guilt to go with it. Its best to enjoy both the satisfaction of taking care of your health and the joy of occasional indulging at a celebration when it’s really worth it. Don’t be one extreme or the other in being perfect or completely going out of control. Plan your number of indulges, keep count, then stop and walk away. This is much easier to do if you have your indulges after eating your healthy fats, proteins and vegetables. Plan coping strategies ahead of time to allow you to take positive action in response to a craving or challenge, instead of feeling helpless. Bring paleo dishes that you can eat at the gathering, eat healthy fats such as an avocado, a boiled egg, or a protein shake before showing up at the gathering. Don’t hang around close the food table, have a cup of water or tea in your hand to sip on instead of putting food in your mouth or find something more interesting at the gathering to focus on other then the food at the table. Satisfy your hunger with the food you brought before looking at what else is available, then set a limit like “I can have one piece of 3 other dishes”. It you see a food that you don’t want to choose to eat but it looks tempting, walk away from it and tell yourself, I can come back later if I still want it, walk away and engage yourself in conversation for at least 10 mins and allow the craving to subside. You don’t have to respond to overeating cues with the cycle of giving in now and beating yourself up later if you have a coping strategy ready to employ. All these techniques will do nothing if you read and forget them. If you overindulged this holiday season, make a specific plan how and when to use these techniques in 2018 and map out a plan to move forward with specific goals. It may sound neurotic to write down your goals, the challenges and obstacles you face and a strategic plan to overcome them. However, it is more advantageous to be neurotic then beating yourself up for blowing it and continue blowing it because you gave up on yourself. If you feel overwhelmed and stuck in the cycle of gaining weight regardless of what you do to try to lose weight, struggling with food choices and feel tired of being hungry and fatigue then it my be time you reach out for help to reset your metabolism, boost your fat burning hormones and detox your body. You are not alone with these challenges that are common with the changes that progressively occur at middle age. Call for a complimentary consultation to discuss your challenges and explore your options in turning your weight around.